Every now and then, there is a buzz about a “miracle” food. Every day there seems to be something new and improved that you should be trying in your diet. One ancient seed that has restored health for centuries and isn’t new to the wellness arena is Flax. Flaxseed isn’t another fad but has many science-backed benefits. Flaxseed maintains its popularity as one of nature’s best sources of nutrients. Flaxseed oil is derived from flaxseeds and is one of the richest sources of plant-based omega-3 fatty acids in the form of alpha linoleic acid (ALA). The Omega-3 fatty acids are linked to better brain and heart function, fighting inflammation, improved immunity and better mood. In addition, flaxseed oil has a sweet and nutty taste making it an easy addition to your recipes and daily omega intake. 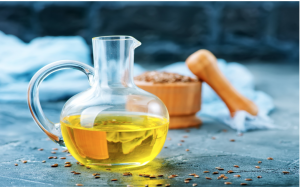 Though often talked about in mainstream media, some people are still not clear about the specific benefits of flaxseed and flaxseed oil. In this article, we look at some of these benefits and why flax should be a part of your healthy diet. Flaxseed oil is derived from flaxseeds and is one of the richest sources of plant-based omega-3 fatty acids in the form of alpha linoleic acid (ALA). The Omega-3 fatty acids are linked to better brain and heart function, fighting inflammation, improved immunity and better mood. Type 2 diabetes is associated with high blood sugar and people with this condition have to take medication to control their blood sugar levels. Flaxseed has been shown to reduce blood sugar levels in type 2 diabetics thanks to its insoluble fibre content. Research shows that the consumption of flaxseed may block the growth of breast tumours. Therefore flaxseed is used in complementary therapy for breast cancer. Also, flaxseed oil ALA helps in fighting cancer growth by inducing death in cancer cells. Colon and lung tumours also respond to flaxseed oil. Ageing causes structural changes in skin collagen which may cause cellulite appearance. 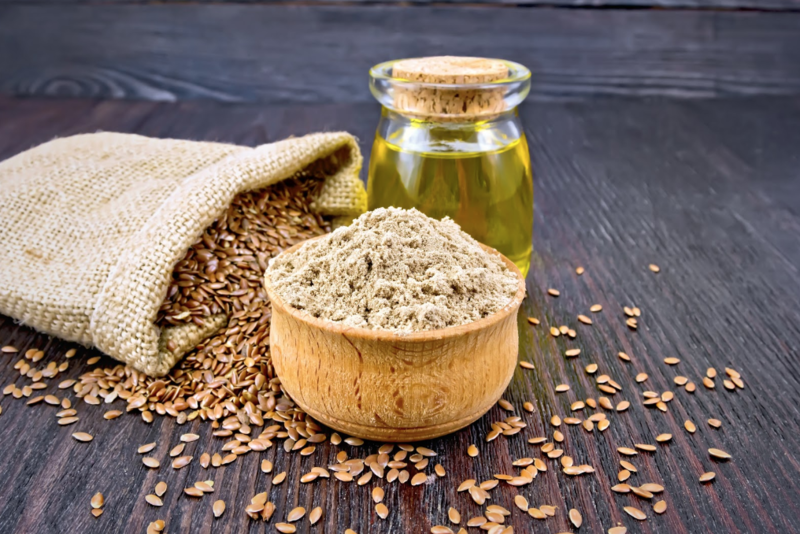 The great news is that taking flaxseed oil can increase collagen production and removing cellulite. Itchy and patchy skin problems such as eczema can also be resolved with the help of flaxseed oil. The use of flaxseed oil improves hydration, skin smoothness, irritation and sensitivity. Can be used as part of your beauty routine! Application of flaxseed oil, rich in vitamins fats and minerals, can stop further hair loss and promote hair growth. Dandruff and flaky scalp can also be treated with flaxseed oil. Massage a tablespoon or two into your scalp and leave in for 20 minutes. Wash with shampoo and you’ll notice a difference in your scalp health and the overall texture and shine of your hair. Snacking on high calorie and unhealthy foods are one of the ways people gain excess weight. Flaxseed is rich in fibre which can reduce the feelings of hunger and suppress appetite. Flaxseed oil also lubricates the colon and help move food more easily through the digestive tract. Since healthy digestion is a crucial part of losing weight, flaxseed oil in your diet can enhance weight loss. Bloating, fatigue and back pain can result from constipation. Flaxseed oil promotes digestion and relieves constipation. The oil stimulates digestive bile release which serves as a natural laxative and is critical for fat digestion. Thanks to its Omega-3 fatty acid and fibre content, flaxseed helps to reduce bad cholesterol while maintaining the level of good cholesterol in the blood. This prevents the blockage of heart vessels due to atherosclerosis. The Omega-3s in flaxseed oil provides the same benefits. Flaxseed oil improves heart function by lowering blood pressure. The Omega-3 acids in the oil regulate blood pressure and prevent heart attack and stroke. Flaxseed oil also restores blood vessels elasticity thus improving blood flow. Flaxseed is a rich source of plant-based protein. The protein helps to improve immunity, fight tumours, and fungi infections. Flaxseed protein also suppresses appetite and promotes satiety as effectively as animal protein. Flaxseed oil has about 50-60% anti-inflammatory Omega-3 fatty acids which help to relieve arthritis pain. It may help in relieving morning stiffness and swelling from rheumatoid arthritis. Intake of flaxseed oil also eases stiffness in the joint in osteoarthritis. Flaxseed and flaxseed oil are a good source of omega fatty acids and other health-giving nutrients. Adding both flaxseed and flaxseed oil to your diet is a great step towards better health and well-being. It only takes a small amount daily to recognize all of these amazing health benefits.